January 2014: Start of men's Devon Cross- Country Champions at Killerton Gardens, Exeter. Chris in his role as awards presenter to medallist at Devon X/C Championships. Chris pictured with one happy recipient of a signed copy of his autobiography during his guest speakers' role at a fundraising luncheon Cancer support group at Bristol in May. 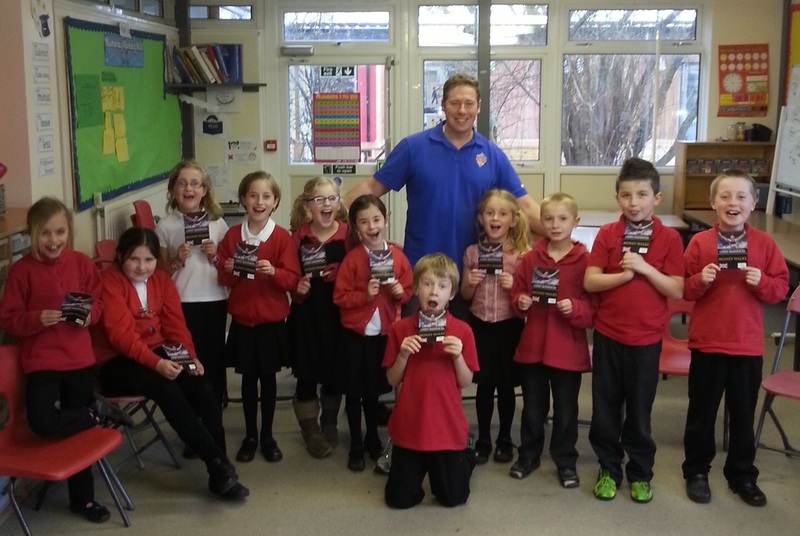 Tiverton Two Moors primary school visit in March. July. Chris assisting friend and former club mate Ed Shillabeer during his 7 day 260 mile charity fundraising race walk, Plymouth - London. Andy Bainborough offering drink aid to Ed Shillabeer en route to Taunton. Ed Shillabeer arriving at Taunton School to a heroes grand reception on day 2 of his fundraising walk for International Cat Care. On behalf of Ed Shillabeer, during afternoon refreshments, Chris gave an 'inspirational' talk about his and his friends' respective racing careers to assembled old Tauntonians. Accreditation for Glasgow Commonwealth Games. Exeter Airport, en route to Glasgow, Chris bumps into old England team-mate, Jo Pavey. Prior to starting his role in July as a commentator at the Glasgow Commonwealth Games, Chris received this Good luck card from his daughter. Glasgow Green, Chris Maddocks pictured with marathon presentation team. Chris working alongside producer Jackie Veal at Glasgow Green as festival on-site announcer and men's & women's marathon race commentator. August. 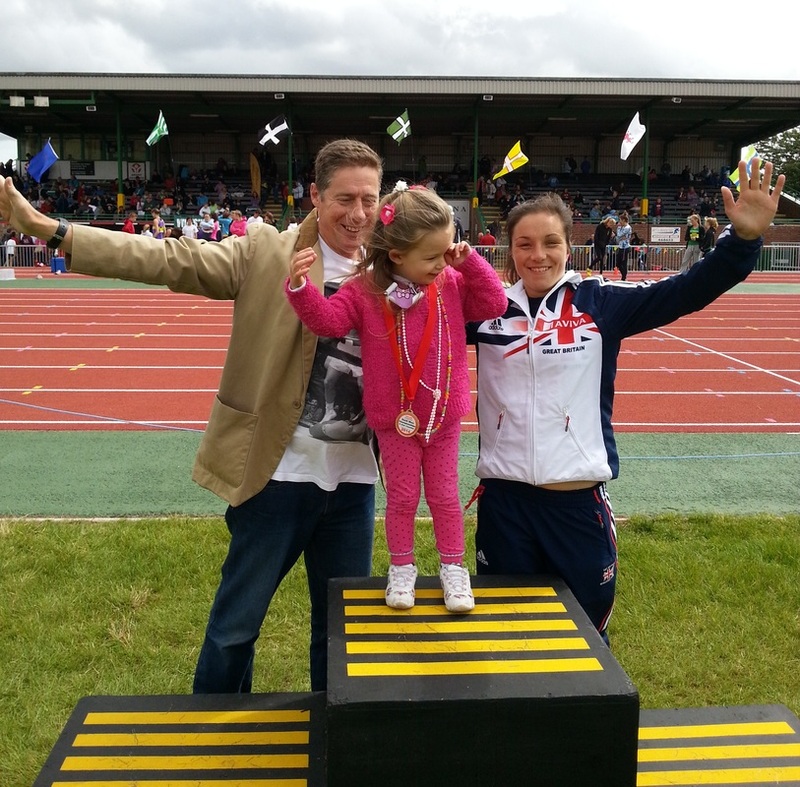 Chris presenting medals at South West Track & Field Championships, Exeter Arena. A special gold medal presented to Eleanor Maddocks. September. Chris Maddocks meets up with old friends during a special tribute luncheon at the Tower Hotel in London for all British Commonwealth Games representative race walkers. Photos by Murray Lambden. Athletes pictured include, L-R Jake Warhurst, Ian McCombie, Roger Mills, Chris Cheeseman, Verity Larby, Karen Ratcliffe, John Cannell, Paul Blagg, Betty Sworowski, and Tom Bosworth. Post luncheon pub drinks with friends. Chris Maddocks signs copies of his autobiography, Money Walks for guests at the tribute luncheon. Here he is pictured with John Hall. A anniversary card commemorating 30 years since Chris Maddocks' participation in the Los Angeles Olympic Games.